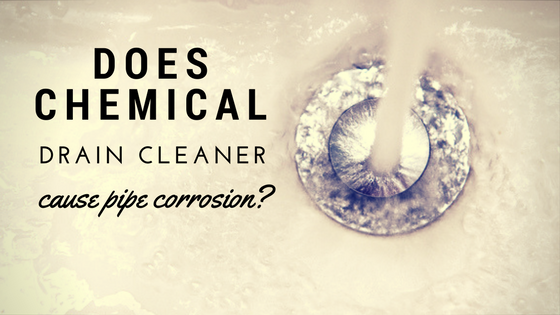 Does Chemical Drain Cleaner Cause Plumbing Pipe Corrosion? A clog in one of your commercial or residential drain lines is cause for immediate concern. With little to no water flow, the drains connected to that line will start to back-up potentially sending gray and black water across your floors, rugs and carpets, but how should you deal with the problem? One way to deal with a clogged drain is to pour a chemical drain cleaner down the drain, but they may damage your plumbing pipes. Drain cleaners are readily available at most grocery stores and home improvement stores, and they are easy to use. All you do is pour a certain amount of cleaner down the drain, wait for the prescribed time and flush the drain with water. The caustic drain cleaner eats through the clog. Unfortunately, chemical drain cleaner does not know the difference between a clog and your plumbing pipes. From the moment you pour it down your drain, it starts eating away at everything it touches, and if you fail yo wear the proper protective equipment, you could get it onto your skin. Some chemical drain cleaners even emit toxic odors that can be hazardous to your health. Caustic drain cleaners can damage pipes and cause pipe corrosion if used improperly or if the chemical fails to destroy the clog. If you plan to use drain cleaner on your plumbing pipes, make sure to read the directions and warnings completely before opening the container. If you don’t understand the directions, don’t use the cleaner and call a professional plumber to clear the clog. If the drain cleaner fails to clear the clog, it will sit in your plumbing pipes and continue to work where it sits. Since the drain isn’t clear, you will not be able to flush the cleaner into the main sewer system. This means you will have a caustic chemical in your drain lines until the line is cleared. Plastic Pipes – If your drain lines are PVC or another type of plastic, never use liquid drain cleaner. The drain cleaner can eat through the plastic, allowing the caustic chemical outside of the pipe and onto other surfaces, even if you thoroughly rinse the pipe after using the chemical. Metal Pipes – If you have old metal pipes, you should also avoid the use of caustic drain cleaners. Old metal pipes typically have corrosion and pits in the metal where the cleaner could enter and not leave, and once the cleaner is in an area where water cannot easily flush it, it will continue to eat your pipes, causing further corrosion and leans. Instead of using a caustic drain cleaner on your drain lines, consider having them cleared by a professional plumber. If you get frequent clogs in your plumbing pipes, there could be a more serious issue, like roots in the line or severe corrosion and deterioration of the pipe. In these instances, you will want to have your drain lines visually inspected with a camera. The camera allows the plumber to see any corrosion and damage to the pipes as well as located any partial or full clogs so that they can be successfully cleared. You may even want to consider the installation of a pipe liner to deter further corrosion and ensure your pipes are completely clean. Here at Nu Flow, we perform plumbing pipe assessments via a camera inspection. This allows our pipe lining technicians the ability to see all the corrosion, debris and partial or full clogs in your pipes, explain the findings to you, tell you if your drain lines wold be good candidates for pipe liners and provide you with an estimate for lining your pipes. 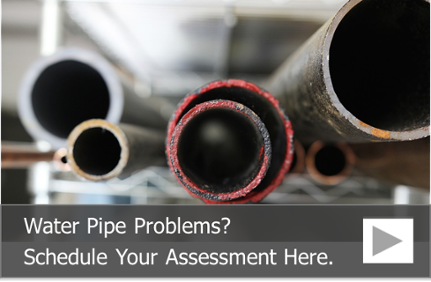 To schedule a plumbing pipe assessment to see if epoxy pipe lining would be right for your commercial or residential building, call us at 815-790-9000.